Mass shootings in Orlando, Fla., Alexandria, Va., and San Francisco during the first two weeks of June — two of them on the same day — have once again put America's complicated relationship with guns in the spotlight. Americans have remained fairly evenly divided between a desire to strengthen gun control measures and to protect gun rights during the past eight years, a Pew Research Center survey taken before the June shootings finds. In the latest poll, 51 percent of respondents said it is more important to control gun ownership, whereas 47 percent said it's more important to protect the right of Americans to own guns. But the divide between Republicans and Democrats who say it's important to protect the right of Americans to own guns has widened since 2000 — from an 18-percentage-point gap to a 54-point gap. This gap is underscored by reactions to the shooting at a congressional baseball practice that sent five people to the hospital earlier this month. Hours after the shooting, U.S. Rep. Paul Mitchell, R-Mich., told NPR that "gun control laws simply limit ... law-abiding citizens." In the same conversation, his colleague, Rep. Val Demings, D-Fla., remained firm in her commitment "to keep guns out of the hands of bad people who shouldn't have them." 89 percent of Americans want to restrict people with mental illnesses from buying guns. 84 percent think there should be background checks for private gun sales and at gun shows. 83 percent want to ban sales of guns to people on no-fly or watch lists. "We can live in a safer place if we kept guns out of the hands of people that shouldn't have them — domestic abusers, felons, people who are dangerously mentally ill, even suspected terrorists," Mark Kelly said during a recent interview with NPR. His wife, former Rep. Gabrielle Giffords, was shot in an assassination attempt in 2011. 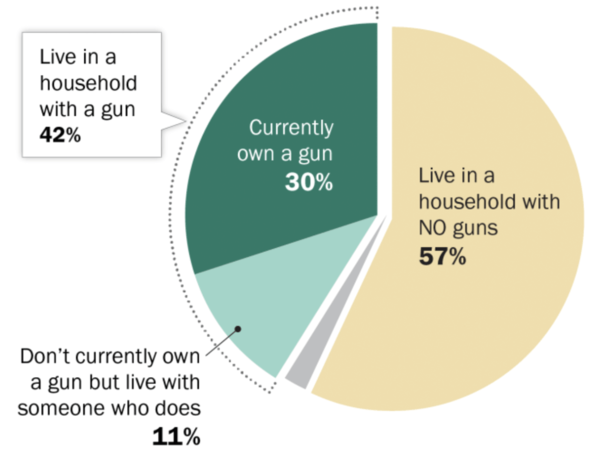 Forty-two percent of adults in the U.S. now say they live in a home with a gun. Pew surveyed nearly 4,000 U.S. adults, including 1,269 gun owners. Fifty-two percent of people who didn't own guns said they could see themselves owning a gun in the future. Forty-four percent of Americans said they know someone who has been shot. And 23 percent said they, or someone in their family, has been threatened or intimidated by someone using a gun. The survey also asked about safety practices; 7 in 10 gun owners said they had taken a gun safety course such as weapons training, hunter safety or firearm safety. Sixty-three percent of gun owners said there is at least one gun in their home that is not kept in a locked place. Fifty-five percent of gun owners have a gun that is loaded and easily accessible to them at home all or most of the time. Poll results come from a survey of 3,930 U.S. adults conducted March 13 to 27 and April 4 to 18. The poll has a margin of sampling error of 2.8 percentage points for all respondents, 4.8 percentage points for gun owners and 3.4 percentage points for people who don't own guns. The question about gun rights was asked as part of a separate Pew national survey, most recently conducted April 5 to 11 among 1,501 adults.